Rio has many street markets, from antiques to arts and crafts, but here we are talking about the “Feiras Livres”, which offer mainly fruit and veg, with a smattering of fish and fowl. These markets appear one day of the week in all the boroughs of Rio, and City Hall, which gives out the operating licenses, have around 150 localities on their official list. They even operate on Sundays. 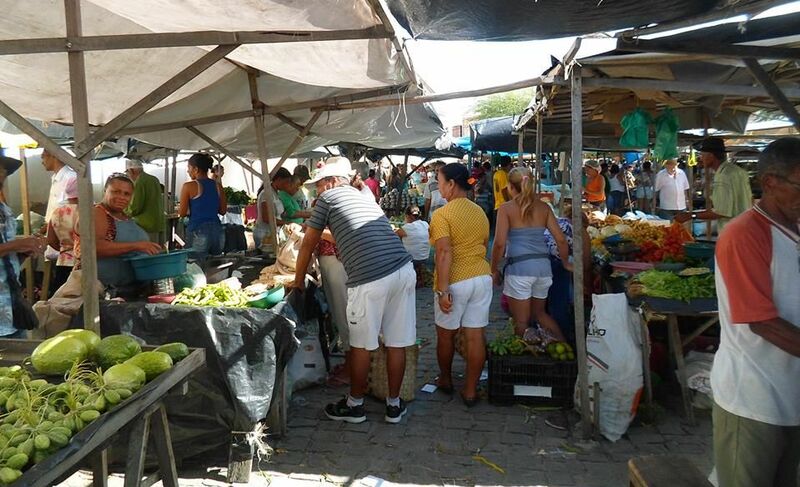 The main advantage of the street market is that in general the prices are lower than those in supermarkets or in the “Hortifruti” chain of stores. The markets cater to the local population, and most customers arrive on foot from nearby. Fruit and vegetables are of a reasonable quality, and there is a wide choice, as the same goods are sold on various competing stalls. The markets open around 7.30 am and close between midday and 1pm. The secret is to go after 11, when prices start coming down so the stalls can clear their shelves. On the down side, customers have to put up with the heat and the lower sanitary standards. Organic and other waste accumulates behind the stalls, and when the stalls are dismantled after 1pm, the city cleaning department, “Comlurb”, moves in and cleans up the mess. Fruit and vegetables are manhandled both by the stall workers and the public, so washing before eating is an important factor. The stalls are a bit rough and ready, some just a simple table, and others stretched out with the use of orange boxes and other devices. All the stalls have protection from sun and rain, in the form of canopies or canvas sheets sometimes precariously stretched between poles. As in most fruit and veg markets, you can choose the produce yourself. This means that by the time you choose yours, many other have probably handled the goods, but again, washing is essential. Bargaining is the norm, and the more you buy, the better the price. 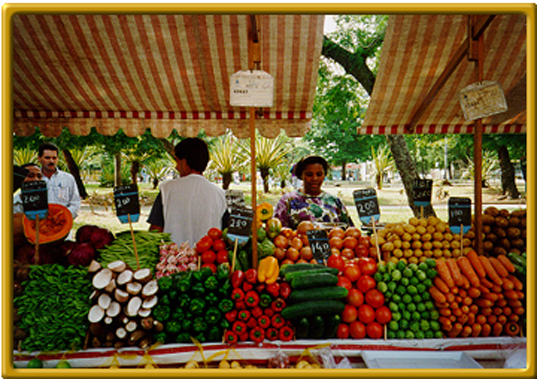 Most frequent customers have their favorite stalls, and will buy all their greens at one stall and fruit at another. Meat is normally not available, but fresh chicken and fish are. Being fresh and not frozen, one has to be a little careful when buying.